Deeside Mineral Water and charity fresh2o have teamed up to launch an exclusive range of bottled water fronted by celebrities and benefiting a good cause. Launching this week, the limited edition 500ml bottles will feature A-list stars all shot underwater by renowned photographer Candice. Actresses Keira Knightley and Kelly Brook, model Lily Cole, plus DJ Judge Jules and Iron Maiden drummer Nicko McBrain are among those supporting the initiative. Sales will help raise money for fresh2o, the charity dedicated to enabling the provision of clean safe water for drinking and sanitation purposes worldwide. And the stars are in good company as Deeside Mineral Water is a celebrity in its own right. It flows from an ancient healing spring near Balmoral Castle in the Scottish Highlands with health properties dating back to 1760. Celebrity drinkers already include Queen Victoria, Lord Byron and more recently Tom Cruise. Ten clinical studies have shown Deeside Mineral Water can benefit health and skin conditions, thanks to minerals absorbed during its 50-year natural filtration process. 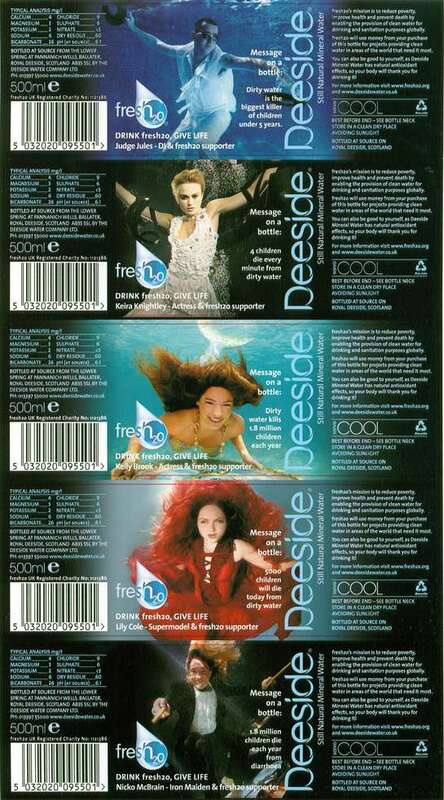 The Limited Edition Deeside Mineral Water is priced from 50p. It is being launched nationally tonight at a fresh2o event at One Marylebone, London, and is being rolled out throughout November.